Hendrik Leys studied under Mattheus Ignatius van Bree and Ferdinand de Braekeleer, who was his brother in law. Early in his career he collaborated with Gustave Wappers and in 1835 he visited the studio's of Delacroix and Delaroche in Paris. He painted historical scenes in a romantic fashion, but from 1839 onwards he was known as a 'pilgrim fron the past' because he used a style that was influenced by old Flemish painters and by German painters like Dürer. In 1855 in Paris he was awarded a gold medal for his painting "De Dertigdagenmis voor Berthal de Haze" (1854, Royal Museum of Fine Arts, Brussels). His work was also shown at the World Exhibition in London in 1862. In that year he was created a baron by king Leopold I. He was commissioned to decorate the new Antwerp Town Hall. He was assisted by Lawrence Alma-Tadema, but he died before his work was completed. 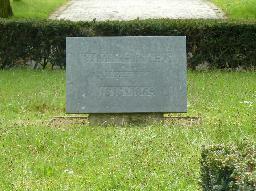 The grave of Hendrik Leys at the Schoonselhof, Antwerpen.